I love the rustic simplicity of these invitations from Laura Macchia. The illustrations depict the wedding venue: a beautiful barn belonging to the bride’s parents, complete with an old stone wall and wooden fence. 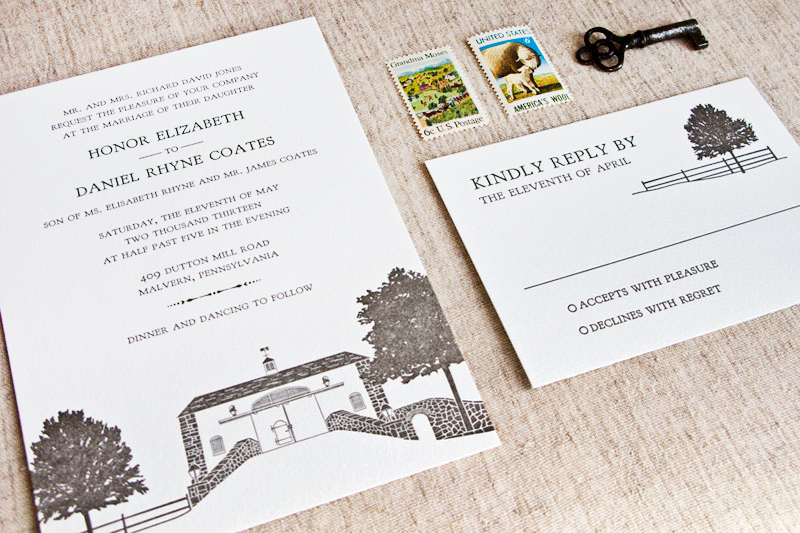 The illustration appears both on the invitations and double-sided post card save the date. Beautiful! From Laura: It was such a pleasure to work with Honor and Daniel this past year on their custom letterpress wedding invitations. They were married in May at Honor’s parents beautiful barn in Pennsylvania. Inspired by Jeff and Amber’s suite, Honor asked if I could create a custom illustration of the barn. Starting with a double sided save the date postcard, we combined the barn with an old style typeface and used a natural color palette of green and slate gray. For the invitation, the addition of the stone wall, fence and trees completes a look that is simple, rustic and sophisticated.